The Golden Retriever Dog Breed will steal your heart- and keep you fit!" The Golden Retriever is very friendly and loves to learn new skills. Bright, Funny And Full Of Life. This is why this dog is one of the most popular of all family pets. They are intelligent, friendly, very eager to please and beautiful to look at. Goldies make excellent family pets, and are generally very good with children and other animals. Most professional breeders would agree they certainly take up time and thrive on attention - most of the time! The Golden Retriever is a high-maintenance dog. 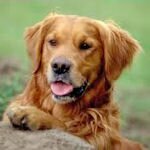 Golden retrievers need lots of regular exercise and a balanced diet to keep them happy and healthy. Goldies, (as they are some times referred to), were originally bred to retrieve game as hunting companions. This dog requires a bit more care and attention than some other dog breeds. If you are considering owning a golden retriever, you should think carefully about their health. Though it is sometimes overstated, Retrievers are more prone to hip dysplasia than many other breeds, particularly smaller ones. This genetically influenced condition can cause pain and eventually can cripple the dog. At minimum, reduced activity and careful control of diet is required. However, Retrievers love to run and eat, so keeping a check on them will take a bit more effort. Golden retrievers are often praised for their calmness, willingness to learn, and high level of sociability towards humans. This is why Retrievers are used extensively across the world as guide dogs and as search and rescue dogs. They require plenty of exercise, and the perfect solution would be dog agility classes. Dog agility classes will strengthen the bond between dog and owner, and you may find a passion you never knew you had! They are very active and therefore require much exercise. They are also prone to obesity. At a minimum they should be exercised at least twice per day. Their coats shed heavily the entire year, and even more excessively during shedding season, which is normally in the spring as the dog loses its thick winter coat. The Golden Retriever dog breed is also prone to certain skin problems. They can readily get 'hot spots' from itching due to allergic reactions, flea bites and other causes. They also have a tendency, especially as they mature, to develop certain tumors and cancers. That opens the possibility of a shortened life for the dog, or at least increased vet bills. Their diet needs should be considered carefully, in order to minimize itching, loose stools and other problems. Goldies are a very active dog. Providing them with the right nutrients for energy, muscle and bone development is essential. Wheat and corn sensitivity is relatively common in the Golden Retriever dog breed, which like all dogs, are by nature meat eaters. Since the Golden is an active dog, they will need lots of exercise. They are so social and tend not to run around on their own. If left outside alone to play, this dog will tend to lie down. It is vital you interact with your Golden Retriever on a regular basis. Fetch, running, rope tug and other games are perfect. All those exercises require your participation. Be sure you have adequate time for this dog! Vaccinations are another area of some controversy among Golden Retriever owners. Most professionals agree that a series of vaccinations is best early in a dog's life. How long that should be continued, past the first two years, is a matter for ongoing debate. Some argue that regular vaccinations represents 'playing it safe', others that shots are unnecessary and risky. Antibodies do remain in the system for several years and the issue is still under investigation. The Golden Retriever dog breed require grooming on a regular basis. Regular grooming is advised, since Goldens have a long coat that requires care in order to stay healthy. Bi-monthly bathing, weekly toenail trimming and similar maintenance activities are an ongoing chore. 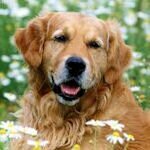 Be prepared to spend time with your Golden Retriever in order to keep a healthy and happy dog. Socializing this breed with other dogs is easy, but also required for mental health and physical safety. Introducing newcomers, both human and other dogs early in life will make the process straightforward. This beautiful, loving dog will give back tenfold all the attention they receive. Golden Retrievers do require time and effort to train and care for properly, but the rewards are immense. 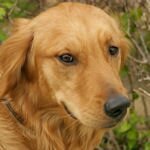 Dog Breed Family The Golden Retriever belongs to the Gundog or Sporting family depending on the kennel club. 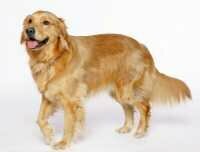 The American Golden Retriever dog breed is less stocky and lankier than the British breed. Golden Retrievers were first accepted for registration by the Kennel Club of England in 1903. The typical life span for Golden Retrievers is 10-13 years. Golden Retrievers are Gun dogs.